In today’s highly competitive business environment, customer service is a practice that should be top of mind for every employee at every company. It doesn’t matter whether you’re a C-suite leader, product manager, or frontline customer supporter; if you don’t cultivate a customer-first mindset, you’re leaving your organization vulnerable to churn (and potentially leaving money on the table). Of course, the primary goal of a customer service team is retaining current customers by keeping them happy. And yet limiting the practice’s definition to that ignores a big part of its potential. The bottom line is this: Providing excellent customer service isn’t just a matter of answering customers’ questions and solving their problems. It should also be a key part of an organization’s marketing strategy. Despite putting what may seem like airtight support measures into play, some companies still struggle with offering a customer service program that wows their clientele and sends the right branding message. Quite often, their problems stem from overpromising and underdelivering. It’s easy for a startup or small business to set lofty customer service guarantees and expectations, then stumble over finding enough hours in the day to deliver. For instance, a fledgling, eight-person organization might not be ready to operate its own in-house support team. Luckily, many elements of excellent customer service can be automated or even outsourced, which eases the burden on the business and helps customers feel valued and appreciated. Another issue facing many organizations is a misunderstanding of what customer service means in the modern sense. Today’s plethora of communications channels (both offline and online) require constant supervision, which can rapidly lead to input overload for a support team. According to one study, 42 percent of customer service personnel surveyed reported that they did not have the resources they needed to effectively perform their roles. And so they do what seems most prudent: pass the problem along to another employee. Not surprisingly, transferring customer service issues between support reps is a key consumer complaint. In fact, a recent study shows that in the United States, a rep’s ability to answer customers’ questions without transferring them is the second most important factor in stellar customer support, coming in right behind overall efficiency. Ignoring this factor becomes a reason for buyers to consider giving the competition a shot. This is where common branding principles and practices can help. When businesses treat their customer service efforts like a marketing strategy — i.e., when they treat customers as individuals to wow, not issues to manage — they’ll see a difference in client satisfaction. One of the hallmarks of a quality marketing strategy is the focus on attracting and nurturing prospects, then converting them into customers. 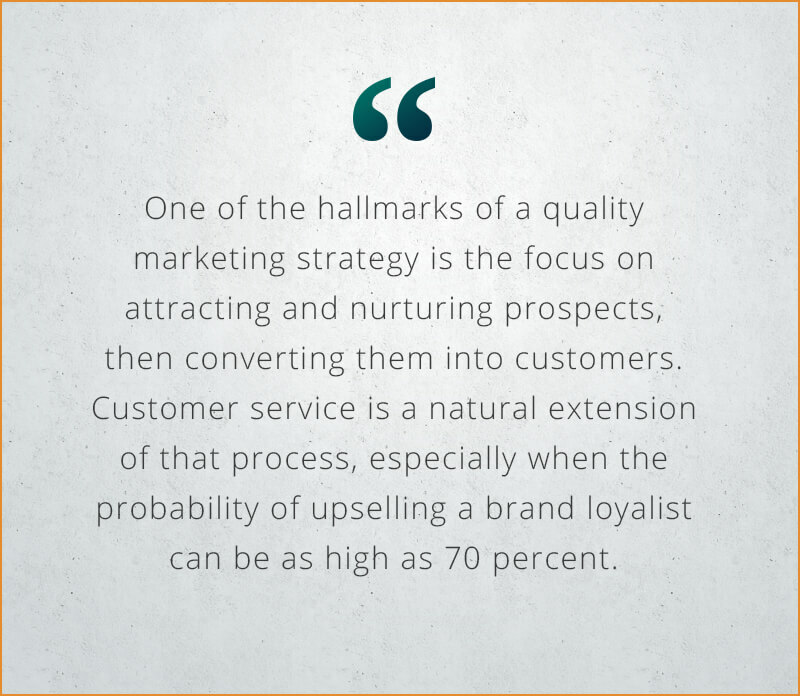 Customer service is a natural extension of that process, especially when the probability of upselling a brand loyalist can be as high as 70 percent. On the flip side, the odds of moving a lead to buyer status can be as low as 5 percent. Every marketer knows that a bad company reputation can cripple even the most well-considered marketing campaign. However, being able to successfully guide the customer journey reduces the likelihood of negative reviews, boosts organic referrals, and increases the likelihood of effective lead generation. In fact, a recent study showed that 59 percent of consumers surveyed were willing to switch to brands that offer improved service. Think of it this way: Every touchpoint an employee has with a customer is a marketing opportunity, whether it’s an overt advertisement, a sales call, or even a frustrated customer calling in with a problem. In fact, the latter scenario poses the most potential for you to turn a negative brand situation into a positive one. All it takes is knowing how to maximize those interactions. 1. Help customers self-serve with automation. Much of customer service lends itself to automation — and automating tasks is a win-win both for employees (whose to-do lists shrink) and for customers (who experience more efficient service). One of the most common scenarios customer support teams face is educating customers on how to use a product. With automation, teams can create programs that drip training sessions over time instead of the lengthier process of training customers over the phone or in person. 2. Leverage automation for customer nurturing. Similarly, many marketers are already leveraging automation to boost their team’s productivity. To make the customer service and marketing union more successful, try applying those same automation principles to your support strategy. For instance, while customer service professionals know the value of regular check-ins with clients, they may not have time to make personalized phone calls. That’s where robust digital platforms come into play. After setting up standardized email templates, marketers can easily help their customer service colleagues automate communications for many support situations. As an added bonus, automated platforms can show customer open rates and keep a log of interactions that will help facilitate increasingly personalized contact in the future. 3. Engage chatbots to handle simple support issues. Most people who live on their devices (and let’s be honest, that’s a lot of us) are open to messaging with brands using apps and chatbots. This technology can be a win-win for both customers and marketers: It allows consumers to not only get immediate answers to their questions, but it also gathers data regarding frequently asked questions and concerns. And support team members? An automated chat system reduces the amount of time they need to spend dealing with simple tasks, instead allowing them to focus on bigger customer experience issues. Your customer service operation may very well be chugging along under its own engine. But why not give it a chance to thrive with a boost from marketing best practices? The health of a modern support operation depends upon a deeper understanding of not only customers’ expectations, but also the processes that nurture them from lukewarm buyers into delighted brand advocates.